It is really neat for you to do a double book and film review Jacqui. The book sounds great. I have heard that Baldwin is well worth reading in general. I most likey will see the movie though. Thanks for the advance word on it. Thanks, Brian. It’s more of a book review really, with just a few comments about the film tagged on at the end. I suppose I was interested to see how the director, Barry Jenkins, would capture the power and lyricism of the novel through a different art form. The story itself feels very visual, so it lends itself very well to medium of film. Great review Jacqui, and good to know that the film captures the book so well. Often that doesn’t happen… I read Baldwin pre-blog but not for a while and not this book so I need to add it to my list of possibles…. Well, yes, these adaptations can often be a disappointment, especially when the film in question doesn’t live up to or match the images we’ve created in our own heads as readers. Luckily, there was no danger of that happening here – I could tell from the trailer that it was going to be good! I have never read James Baldwin, this sounds so poignant and thought provoking. The quotes you have picked show Baldwin to be a writer who thoroughly engages with his characters, the voices come across so strongly. I will look out for the film. Yes, spot on, Ali. It’s the voices that really pull you into this narrative with their combination of truth, power and authenticity. As you say, definitely a writer at one with his characters. I’ve also read Baldwin’s jazz novel, Another Country, a book that explores issues of race and sexual identity. That was quite a while ago, mind – certainly pre-blog. In fact, I’m left wondering why it’s taken so long for me to get around to reading him again – a question of time, I guess! Wonderful review Jacquie and I will certainly look out for the film.Like you I read Another Country years ago and thought the writing was excellent. I’m a little surprised that more people aren’t reading Baldwin these days. His work feels so relevant to some of the issues we’re still grappling with toady, not just in the US but in many other countries in the western world too. Maybe the film will give him a bit of a boost – if nothing else, it certainly made me want to revisit his books. I completely agree. I wonder if he has been overlooked because he is gay and not part of the macho canon like Hemingway, Roth or Bellow. Yes, I think you’re probably right on that score. He doesn’t fit into the straight white male clique of American writers. Mind you, I think he’s all more interesting for that! Exactly. I have just read an old Carol Shields book where she attacks the dominance of white male writers as opposed to women writers. She missed the fact that writers like Baldwin were overlooked too. Ah, interesting. I haven’t read any Carol Shields for ages! 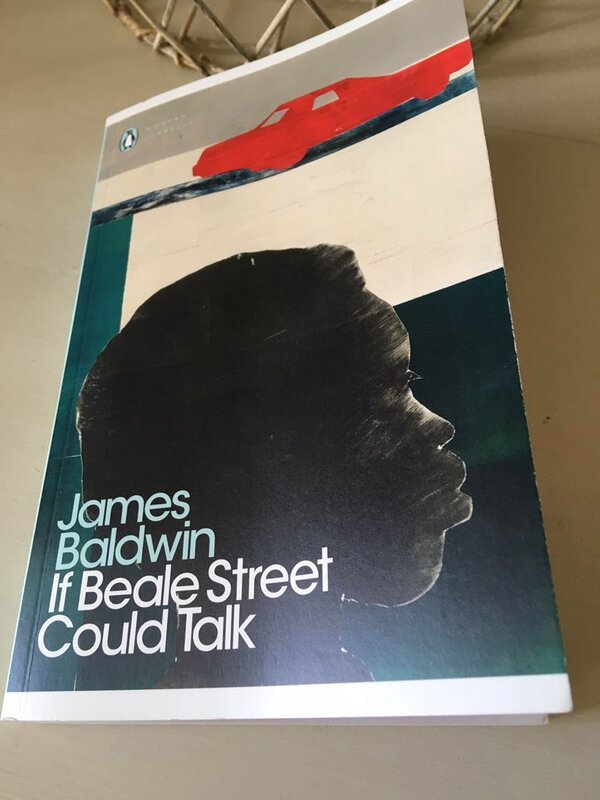 Check out this review of the book, If Beale Street Could Talk by James Baldwin, from this post on Jacqui Wine’s blog. Many thanks for the share, Don Massenzio – very kind of you. I want to read the book and watch the movie. It’s so rare that movie and book complement each other like this. They both sound excellent. I haven’t read Baldwin in ages and only short stories. He’s so good. I should get to his novels finally. I think he’s almost certainly underrated, especially in today’s day and age when his work still feels so desperately pertinent. It’s a really powerful book, but so beautifully written that you can’t help but be swept up by the story. And yes, it’s rare that a movie adaptation lives up to the book so successfully. I think it helped that I’d seen the trailer first as I was then able to visualise Tish and Fonny quite clearly in my mind while reading. You think he’s underrated? I always thought he was highly regarded. That’s too bad as his and themes are just as important today. I just don’t think he’s had the same level of exposure as, say, someone like Philip Roth or John Updike, especially with the general reading public. So, I think he’s known and highly regarded in certain circles, but perhaps not generally if that makes sense? I can barely recall anyone, even across the literary blogosphere, reviewing or covering one of his books in recent years. I think Emma wrote about some of his short stories a couple of years ago, and Niven Goviden picked one of his books for an episode of the Backlisted podacst, but apart from those two, I’m struggling to recall any others. Compared to those two, yes, he’s under appreciated. I seem to remember coming across reviews on blogs, only I couldn’t tell you who, apart from Emma, wrote those reviews. Possibly Danielle from A Work in Progress. Litlove possibly too. But it’s not frequent. Oh and Max maybe as well. Excellent review, Jacqui. I’m glad both book and movie met your expectations; from those extracts it sounds like a powerful read. Those comments by the Daniel character up were very mindful of the current series of the Serial podcast, which follows the justice system in a predominantly black area of the US. Disturbing to think that so little has changed. I think this book might make me mad, but perhaps mad with admiration too. Oh, I had forgotten that there was another season of the Serial podcast out there. I shall have to catch up with that – thanks for mentioning it. Yes, I think you probably would feel pretty angry or frustrated with the system after reading this book, but I’d say it’s worth it for all the reasons I’ve mentioned above. A word of warning, though – the novel ends with a punch to the guts, one that leaves you reeling from the wider tragedy of Fonny’s situation. I have read Going to Meet the Man and it’s one of the most memorable books I’ve read in the last years. Baldwin’s prose is exceptional. Don’t you think he gets you closer to understanding what racism does to a person when it’s aimed at them? As you say, his descriptions are accurate, objective and without any hate. It’s a fact, its described in a sensible yet sensitive way and it helps one’s perception of racism. Powerful. I have Go Tell It On the Mountain on the shelf, I heard it’s an excellent one too. I recall that review and the powerful effect the book had on you at the time. It was very striking. And yes, I complete agree that Baldwin manages to convey what it must feels like to be the victim of racial abuse and discrimination, of false assumptions and prejudices. Not in a didactic or shouty way, but in a manner that just feels very real and heartfelt. It’s all the more powerful for that. I think the film really captures that too – it’s a very emotive piece of work, beautifully shot. Go Tell It on the Mountain sounds excellent. I look forward to hearing how you get on with that. This sounds excellent, as does the film. It’s terrible to say I’ve never read Baldwin. I have Go Tell It on the Mountain in the TBR, so hopefully I can rectify this soon! I’d neither heard of the book or the film – in fact, I’ve not read Baldwin at all. Perhaps things may change as I’m finally engaging with race in America via William Kelly’s A Different Drummer. I do recall your American lit month a few summers ago. Do you think you might have another of those at some point? If so, Baldwin would make a great choice. In the meantime. I shall keep an eye out for your post on A Different Drummer. It’s a book I’ve seen in various bookshops recently, so I’m wondering if its being positioned as another Stoner…a lost classic and all that?